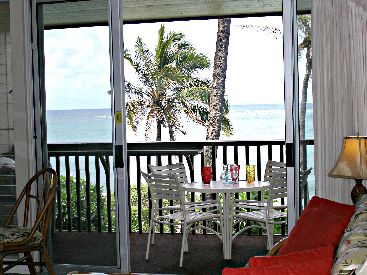 Oceanfront condominium with beautiful ocean views overlooking Wailua Bay. Wailua Bay Beach is a popular body surfing and board surfing beach. Enjoy the views and the sound of the ocean from your lanai, living room and kitchen. Wailua Bay View Apartments Resort includes 45 units with a pool with BBQ area and well-maintained grounds. It is located close to Coconut Marketplace, restaurants and shops and Wailua Golf Course. This one bedroom/one bath condo offers a full kitchen, washer/dryer, and comes fully furnished in beautiful condition. Condo is currently in the on-site rental program. Air-conditioned in bedroom.